Home News Nelson Mandela’s pistol given by Ethiopian Emperor Haile Selassie found? Nelson Mandela’s pistol given by Ethiopian Emperor Haile Selassie found? 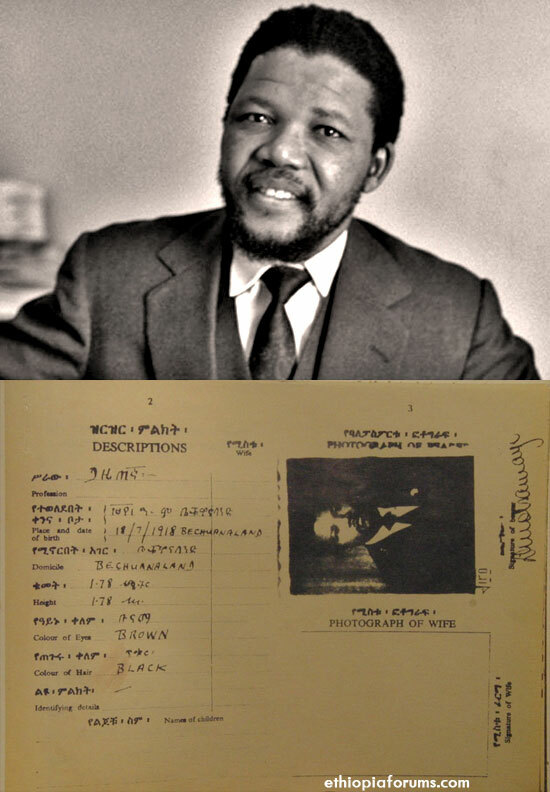 Mandela’s Ethiopian Passport under the name David Motsamayi given to him by His Majesty in 1962 .This African solidarity is null today.Is there any African country that does this or help fleeing Ethiopian youth?One interesting thing in the above passport is the profession of Madeba;the Amharic above says Journalist.Madeba the gazetegna! “In 1962, Mr. Nelson Mandela secretly travelled to Ethiopia for military, political and spiritual training. Haile Selassie’s Ethiopian army, on the orders of Haile Selassie himself first trained and armed Nelson Mandela in his struggle against apartheid South Africa. On the personal orders of his Majesty, the Ethiopian Colonel in charge of Mandela’s military training gave him a gun with which he was to bring down the ignoble and unhappy apartheid regime still thriving at that time in South Africa. Mandela went back to South Africa to continue his struggle. The rest is history. A search to find a pistol owned by Nelson Mandela said to be the first weapon of the African National Congress’ armed resistance to apartheid rule and given to him while he was in military training in Ethiopia has ended under the house of a South African pop star. The gun was given to Mr Mandela by an Ethiopian Colonel who gave him military training while he was on the run from South Africa’s white government seeking to prosecute him for his political activities. When he returned to South Africa, just weeks before he was arrested and jailed for 27 years, he buried it in the grounds of the farm where he was staying. Now, trustees of Liliesleaf Farm in Johannesburg believe they have established where the Bulgarian-made pistol lies. They are looking at bringing in excavators to search under a house which was built over it and is now inhabited by a local pop star. The gun has an estimated value of 22 million Rand (£1.8 million). With 92-year-old Mr Mandela’s health fading, the trustees fear it is their last chance to find the weapon in his lifetime. The Makarov pistol was given to him in 1962, as he toured the world seeking funding and training for Umkhonto we Sizwe, or ‘Spear of the Nation’, the armed wing of the ANC he established to fight apartheid. In Ethiopia, he received military and political training from Emperor Haile Selassie’s army. When Mr Mandela left Ethiopia, the colonel in charge of his training give him a gun to symbolise his coming struggle – reportedly on the instructions of the Emperor himself. Allister Sparks, a South African journalist who is a friend of Mr Mandela’s, said the gift had meant a great deal to the freedom fighter, who went on to become South Africa’s first black president in 1994. “It was essentially ceremonial, but, to my knowledge, that may have been Umkhonto we Sizwe’s first weapon,” he said. In late July 1962, perhaps mindful that his days of freedom were numbered, Mr Mandela wrapped the Makarov pistol in foil and an army uniform and buried it under a tin plate along with 200 rounds of ammunition in a 1.5-metre deep pit. During his subsequent 27-year stay in jail, other properties were built in the grounds, including one on top of the suspected gun burial site. After Mr Mandela had been released, he visited Liliesleaf in 2003 and pointed out to Nicholas Wolpe, the son of a former ANC activist and chief executive of the Liliesleaf Trust, where he believed the gun was hidden, telling him: “I hope you find it”. Mr Wolpe says he is confident that the weapon is underneath a house adjoining the farm, 5 George Avenue, which is owned by 77-year-old pensioner Al Leenstra and inhabited by a pop singer called JMaxx. Mr Leenstra has said he would be willing to sell the house for it to be demolished but Mr Wolpe is hoping it may not be necessary. The trust is looking into bringing in a team which normally works in war zones, using dogs which can scent ammunition. Mr Wolpe said he believed the gun had “real personal significance” for Mr Mandela, and has made it his personal mission to find it. “The final excavation and showcasing of this pistol is awaited by many. African nations of toady ought to learn from this historic pistol and its linked legacy.Africans should stand in solidarity – help one another-fight foreign dividers -remove jealousy- help fleeing African brothers and sisters.” Ankober recaps. Long live Madeba and HIM Hailesellasie,who beaconed the beginning of the end of Apartheid.